Beauty therapist wanting to work the season in Ibiza during 2019? Entrepreneur wanting to start a proven, exciting, successful growing business? A business wanting to offer massage and beauty services? Or to outsource the spa area? Contact us. Book a massage or beauty treatment with one of our expert beauty therapists. 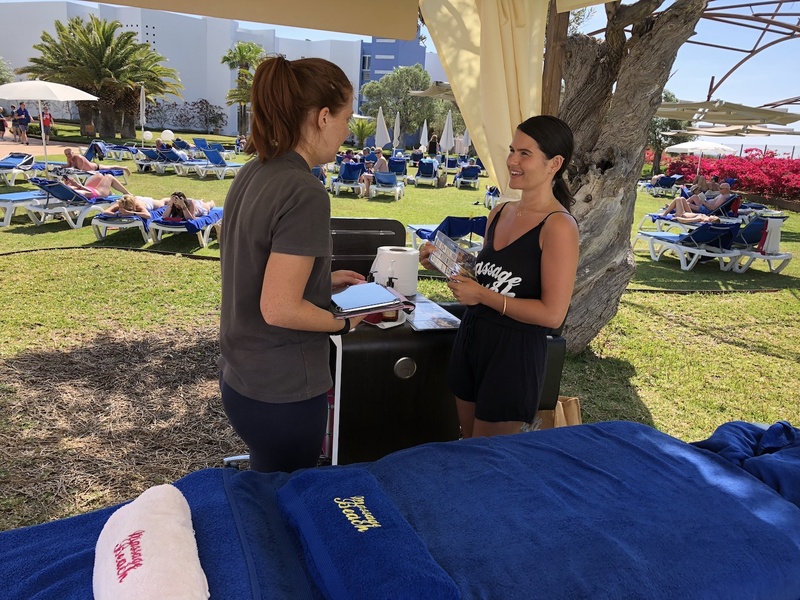 Book a treatment/s at one of our Ibiza hotel locations or utilise our mobile service where we come to you. A full range of luxurious beauty therapy and massage treatments at Sirenis Vital Spa in Playa D'en Bossa. Complimentary use of the spa facilities with every treatment. Head, neck and shoulder massage to relieve tension and induce a sense of well-being. Back, neck and shoulder massage to soothe whilst reducing tension and strain. Choose between relaxing and deep tissue manipulations for your perfect treatment. Massage to help alleviate tight, stiff, tired leg muscles. Ideal for sports people. 60 minute full body massage focusing on untangling knots and relieving tension in the deeper muscles, connective tissues and tendons. 90 minute whole body massage focusing on untangling knots and relieving tension in the deeper muscles, connective tissues and tendons. 60 minute whole body relaxation massage. This therapeutic treatment relaxes muscles and joints whilst assisting your body in alleviating toxins. 90 minute whole body relaxation massage. This therapeutic treatment relaxes muscles and joints whilst assisting your body in alleviating toxins. 60 minute anti-stress massage focusing on the back, head, neck, shoulders and arms. Restoring physical and mental peace. Full hand and nail treatment. Nail shape, cuticle tidy, exfoliation, mask, massage and moisturise. Nail lacquer to finish. Pamper your feet and lower leg. Nail shape and cuticle tidy, removal of hard skin, foot scrub, soak, mask, massage and moisturise. Nail lacquer to finish. Express treatment focusing on your nails. Hand revitalise, nail shape, cuticle tidy, moisturise and nail lacquer. Express treatment focusing on your nails. Foot revitalise, nail shape, cuticle tidy, moisturise and nail lacquer. Must have treatment for modern men. Hard skin removal, cuticles tamed, nails trimmed, foot hydration, soak, scrub and massage. Deep cleansing, stubble soothing treatment for men. Cleanse, tone, scrub, massage, mask and condition. Leaving a brighter complexion. Cleanse, tone, massage and moisturise. Full facial treatment adapted to your skin type to remove impurities and leaving skin radiant. Double cleanse, exfoliate, massage, mask, tone and moisturise. of massage oil used in 2018.